I’m a fan of things that hold other things. A purse with sections and pockets will give me delight as I tuck my phone here, my reading glasses there, ink pens lined up in just the right place. 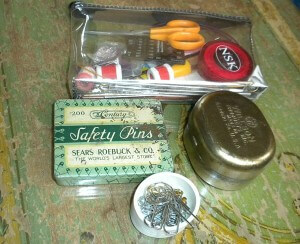 Odd little tins of stitch markers and notions provide tremendous pleasure too. The same goes for my knitting. 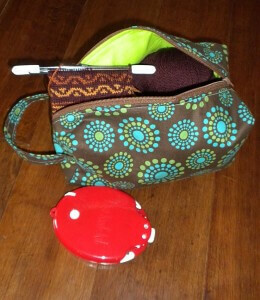 My winter purse has plenty of room for not just my glasses, billfold, and a small journal but a small knitting project. 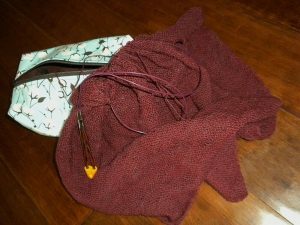 If we’re not going to be gone from the farm more than a day, one small project is all I need – not my entire big knitting bag. 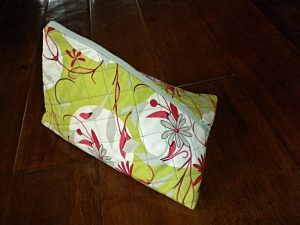 For years I’ve tucked just an open project bag into my purse but I’ve been seeing the bright colorful fabric bags that zip all over for some time now. Not long ago I bought my first one from MissMisoCrafty. 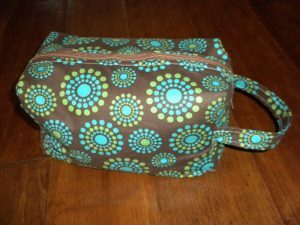 This is your basic box bag design measuring 5x8x4 and is fully lined with a handle. It’s beautifully made, the inside has no exposed raw edges and the walls are gently reinforced to keep their shape. There’s plenty of room inside for my Bridgewater Shawl which is still in the garter stitch stage – but steadily decreasing to the point that I’ll be picking up stitches and adding the lace border before long. 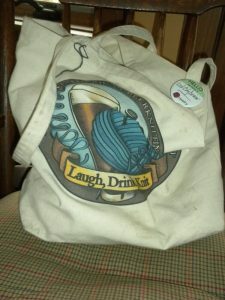 I liked my first box bag so much that when I saw this one from Lazy Sock Monkey (on Ravelry) at the Arkansas Fiber Arts Extravaganza I decided a second bag was a reasonable purchase so I wouldn’t need to switch whatever project I wanted to carry into the one bag I owned. 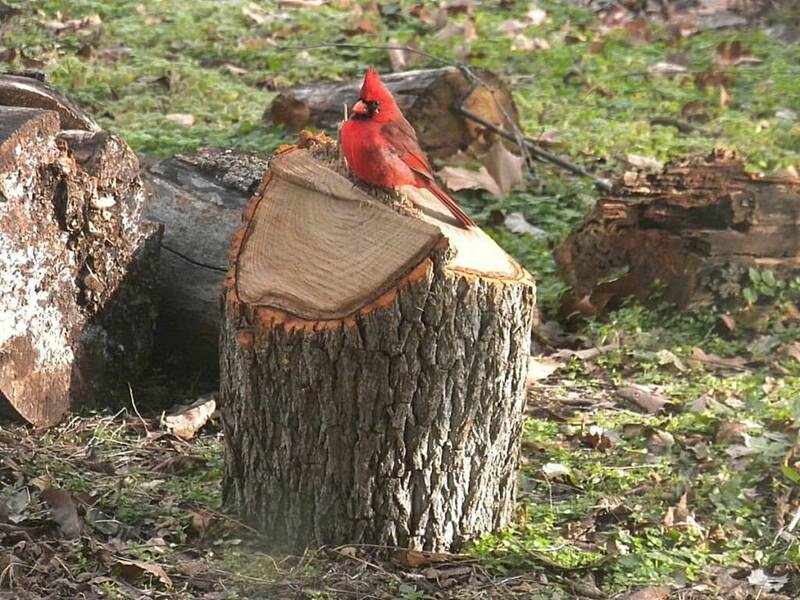 The color on this one is what sold me. I love a good brown – but the bright green interior of this one made the choice easy. 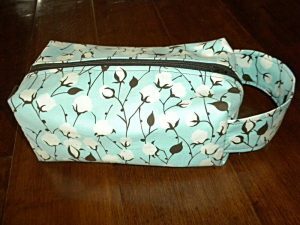 The side walls aren’t quite as firm as the first bag, which makes it easy to squish into my purse. As with the Miso bag this one is a good size for a medium project – like a colorwork mitten with three balls of yarn attached. 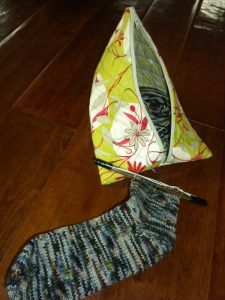 My handy all-in-one Knit Kit slides right under the yarn – just in case I need it. The most recent addition to my bag collection was found at the Alliday Show. This quilted triangle bag from Lone Chimney caught my eye. I love the shape on this one! It’s perfect for a smaller project – like my DVD socks. The ball sits nicely at one end of the bag and my project at the other. Sitting on a table beside me – this one allow the yarn to feed nicely to the project in my lap. The Lone Chimney team is a mother-daughter trio and I had the privilege to meet two of the three ladies at the show. Incredibly nice women with a flair for fabric. for a new year full of fine health, good friends, and the joy that comes from leading a creative life. Happy Holidays to you can Chris and Hillary! Hope to see you soon!